Pressure is growing for tougher gun-control laws after a mass shooting at a Florida high school, with thousands of angry protesters at state rallies demanding immediate action from lawmakers, and more demonstrations planned across the country in the weeks ahead. Organizers behind the Women’s March, an anti-Trump and female empowerment protest, called for a 17-minute, nationwide walkout by teachers and students on March 14. The Network for Public Education, an advocacy organization for public schools, announced a day of walkouts, sit-ins and other events on school campuses on April 20, the anniversary of the 1999 shooting at Columbine High School in Colorado that left 12 students and one teacher dead. Plans for the protests circulated widely on social media on Saturday, as students, parents, teachers and neighbors gathered to express their grief over the fatal shooting of 14 students and three staff members at the Marjory Stoneman Douglas High School in Parkland. 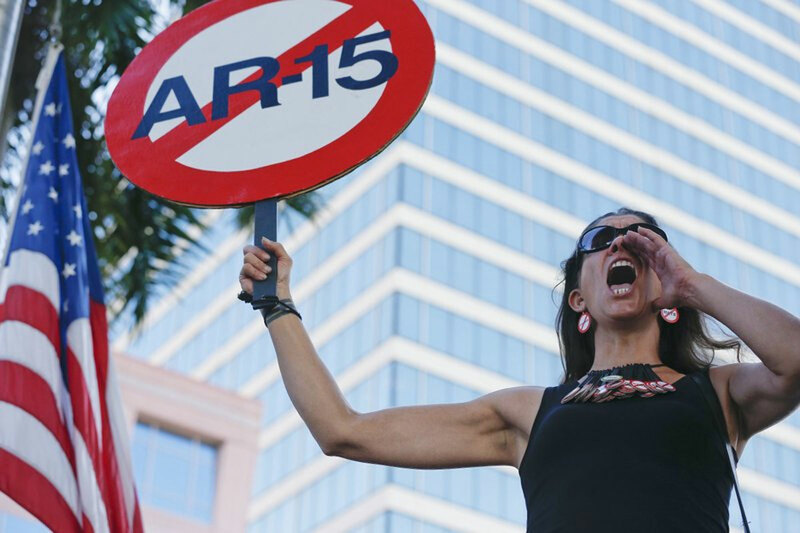 Hundreds showed up at rallies in Fort Lauderdale, about 25 miles (40 kilometers) away, and in St. Petersburg, 250 miles (400 kilometers) northwest, to demand action on gun-control legislation. Three days after one of the deadliest school shootings in American history, guns shows went on as scheduled in south Florida. “The fact that we can’t go to school and feel safe every day, when we’re supposed to feel safe, is a problem,” said Fabiana Corsa, a Florida high school student who attended the Fort Lauderdale gathering. Corsa said legislators were “sacrificing students” in order to get money from the National Rifle Association. The rallies were held as new details emerged about the suspect, Nikolas Cruz. Authorities say Cruz, 19, was a former student at Stoneman Douglas who had been expelled, had mental health issues and had been reported to law enforcement before he used a legally purchased semiautomatic rifle to take the lives of 17 people on Wednesday. From a mosaic of public records, interviews with friends and family and online interactions, it appears Cruz was unstable and violent to himself and those around him — and that when notified about his threatening behavior, law enforcement did little to stop it. Cruz’s mother died in November and his father died years ago. He reportedly left a suburban Palm Beach County mobile home where he had been staying after his mother’s death because his benefactor gave him an ultimatum: you or the gun. According to the paper, DCF’s investigation was completed that Nov. 12. The agency concluded Cruz had not been mistreated by his mother, was receiving adequate care from a mental health counselor and was attending school. At school, Cruz routinely fought with teachers, was accused of swearing at staff and was referred for a “threat assessment” in January 2017, two months after the DCF investigation concluded, The New York Times reported Saturday, citing school disciplinary records it obtained. The records show he was suspended several times in the 2016-17 school year and was frequently absent. They also show Cruz attended at least six schools, including a school for students with emotional problems, the newspaper said. Cruz had been diagnosed with autism, a neurological disorder that often leads to social awkwardness and isolation, and attention deficit hyperactivity disorder, or ADHD. The FBI said a person close to Cruz called the FBI’s tip line and provided information about Cruz’s weapons and his erratic behavior. The caller was concerned Cruz could attack a school. The agency acknowledged the tip should have been shared with the FBI’s Miami office and investigated, but it was not.